Phetprasert Tour is a privately-owned tour bus company in Thailand located at the Muang Phetchabun district by Samakkhichai Road. Muang Phetchabun is known as the capital district of Phetchabun Province which situated in south central Thailand. They provide a wide range of routes covering destinations all over Thailand with plenty of choices for customers to choose from to enhance their customer base. In order to maintain the convenience for their customers, the ticket counters at bus terminals such as Bangkok Bus Terminal (Chatuchak), Kalasin Bus Terminal, Khon Kaen Bus Terminal, Chachoengsao Bus Terminal and others are still in operation. Alternatively, you can purchase your bus tickets via Easybook website or mobile app easily. 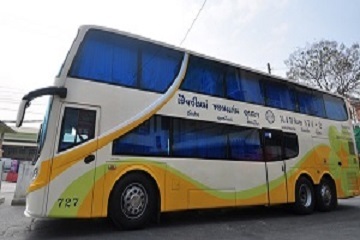 The bus routes provided by Phetprasert cover nearly 30 cities in Thailand with a large number of routes to choose from that travel within Isan and northern Thailand. The more popular bus routes with this company, travel from Phitsanulok and Khon Kaen to Chiang Mai and its return routes. The pick-up and drop-off point for Phetprasert buses in Chiang Mai is situated at Chiang Mai Bus Terminal 2 (Arcade). It is located at Kaew Nawarat Road in Amphoe Mueang Chiang Mai just a few kilometers away from the city center. The other pick-up and drop-off point of the operator is at Phitsanulok Bus Terminal 2 which is located in Samo Khae. There are also Khon Kaen Bus Terminal and Chum Phae Bus Terminal serving as the pick-up and drop-off points for Phetprasert buses in Khon Kaen. The company is currently managing a large fleet of express buses for the convenience of travelers around the region. Phetpraset mainly come in double decker buses which are equipped with 48 seaters. With "2+2" seating arrangement for their double decker buses, you will also be able to find air-conditioning systems onboard to ensure a cooling ambience while riding in the vehicle. The reclining seats in the buses allow passengers to sleep comfortably especially throughout the long-haul journeys. Travelers will be able to have a pleasurable time during their ride with Phetprasert bus with the spacious leg rooms onboard. You will be able to know that purchasing bus tickets from this company is worth your money to have a wonderful bus experience. Phetprasert is one of the best transportation choices if you are planning to travel to several places in Thailand. It is super easy to book the bus ticket online through Easybook's website and mobile app. Go ahead and book your Phetprasert bus ticket now!